In fact, the first outboard in the world was an electric. It was the Frenchman Gustave Trouvé as sometime about year 1870 introduced his "propeller-motor". It was assembled on the boat like a dinghy-rudder and was powered by battery. 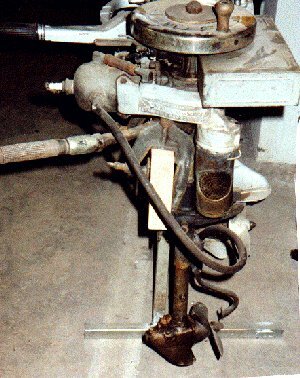 The electric cable was also steering wire.The first petrol powered outboard was introduced in 1896 by American Motors Co. It had turnable propeller-blades for reverse. They made only about 25 motors. Even some other American company tried to manufacture outboards, but the engines were often difficult to start, rattling and spiting little monsters and the owner soon got back to rowing again. Even here in Sweden we were early in developing outboards. It was the mechanical workshop "Vulcan" in Norrköping as from year 1890 made under license from Daimler a paraffin-engine of four-stroke type. They began in 1896 to manufacture an outbord version of this engine. The engine stood horizontal and the transmission to the propeller was a cable in an S-designed pipe filled with grease. Not until Ole Evinrude constructed his outboard the development increased. Maybe it newer had come to the world if Ole not had a girlfriend who was very fond of candy. One warm day in the spring in 1909 she wanted to eat ice-cream, and Ole, who were a well-mannered gentleman were rowing that 8 km to the nearest ice-cream vendor to buy it for her. Even how fast he try to row, the ice-cream was almost melt when he came back and Ole decided that he would construct an engine easy to assemble on a rowboat. The result was a single-cylinder water-cooled two-stroke engine at 1,5 hp. This outboard came to bee the prototype of all modern outboard motors. They are still constructed like Ole Evinrudes first outboard. The Evinrud-motor doesn't sell so well in US, but it was the export-market as discovered the inventing. In fact the mostly orders come from the Scandinavia, there among others the fisherman make use of the new aid. The demand for outboards in Sweden was bigger than the supply, and many local workshop try with variable success to manufacture outboards. In the beginning was it often copies of the Evinrude. After a while the competition was harder and they have to come whit own refinement and constructions. One of the disadvantage with the Evinrude and the copy was that they vibrate a lot. The brothers C.A. and O.W. Hult as had an engineering workshop in Sundbyberg, "AB Archimedes" constructed in 1912 the first two-cylinder outboard in the world. It was of boxer-type with the cylinder against each other, for reduce the vibrations. It was introduce under the name "Balansmotorn" just because it's running without vibrations. The Hult brothers and the Archimedes factory maintain that principle with only one exception until they take over the license for Penta outboards from AB Volvo in 1943. The exception was a little one cyl. engine at 3 hp as introduce in 1922 under the name "Brio". It wasn't successful, and was out of production in 1926. The boxer-engine B22 as was constructed about 1930, was in production until 1979 , when Volvo as own the outboard factory this time finished the outboards manufacturing. In 1918 practised an young technician, Carl-Axel Skärlund at the "Archimedes" factory. He tries to interest the Hult brothers for an new idea. He had constructed an engine with the cylinders in a line, with one over the other. In fact were Skärlunds idea the base for the modern outboards. However the Hult brothers had launched their boxer-engine and were not interesting for something new. But Skärlund made a prototype and he was in an outboard competition. When he was nearly to win the race the outboard jump of the boat and disappeared in the water. Requested divers could not find any engine in spite Skärlund had taken marks. The diver sad that marks maybe was made in the boatside. Then Skärlund jump in the water himself and finally find the outboard. The race had been seen of the manager for Penta, Engineer Egnell who get interesting of the engine and a co-operating beginning. The manufacturing of the new outboard started in 1922. Its called "U2" and the first four hundred outboards was made in Stockholm. After that the manufacturing moved too Skövde. In 1929 modernised the outboard and the new name was "U21". This outbord was in production until 1963. U2-U21 was in production longest of all outboards and exported over the whole world. The word Penta came to bee word for outboard in many native languages. Some points in the outboard story. -1866. The American T. Recce applies for patent on a new contrivance for propulsion small boats. In the application Recce wrote: " The intention with this invention are to furnish small boats with, a hand-powered propeller-apparatus for propulsion small boats, and without difficulty can be fitting on or off from the boat". This invention makes not any bigger success. -1870 (approx.) The Frenchman Gustave Trouvé come with the first motor-powered outboard in the world. It was electric powered. -1896. Introduce American Motors Co the first petrol-powered outboards. -1909. Ole Evinrude constructed his outboard, the first as functionary tolerably and was sale successfully. -1911. Br. Hult with Archimedes factory comes with the first twin-cylinder outboard in the world, "Balansmotorn". -1913. The first outboard with magnetic ignition, the Swedish "Alka". -1922. The first twin-cylinder outboard with the cylinder in line, one over the other, "Penta U2", constructed of Carl-Axel Skärlund. It was in production until 1963. -1979. Volvo ended produce of outboards in Sweden.